In 2018, Harry’s raised $112 million to expand from a shaving company to a house of CPG brands akin to Proctor & Gamble. They reached out asking what category they should conquer next and how. Through too much time spent talking to strangers in Target & plugging away at numbers in Excel it became clear the pregnancy aisle was ripe for brand & business disruption. Most importantly though, it was also ripe for a dose of reality because the pink, perfect products made moms-to-be feel like pregnancy was solely their responsibility. To solve for the isolation & misrepresentation, we created a pregnancy brand built for modern partnership. As Harry’s Inc. continued to expand beyond Harry’s Grooming, they were looking out over the CPG landscape and wondering what was next. Whatever it was, they wanted it to have nothing in common with any categories they had entered before. With that being the only constraint, their verbatim ask was to “create a brand plan.” After several rounds of business and brand analysis, we decided to focus on disrupting the pregnancy category for the better. Take a walk down the “feminine care & planning” aisle… You’re instantly drowning in glowing mom silhouettes, storks, and seventeen shades of pink. Not to mention that none of these pink perfect brands look at pregnancy as a process. Instead, you’ve got a pregnancy test brand, a pregnancy vitamin brand, a pregnancy lotion brand, a pregnancy sock brand… No wonder 48% of moms-to-be, unprompted, said they have no favorite brand in the category. The lack of leadership was rooted in something much greater than siloed offerings though. Majority of women agreed that the responsibility primarily weighs on them from trying-to-conceive through birth. In the face of such a huge, emotional responsibility, majority of women are looking for ways to further involve their partner in the pregnancy. Their partner though? Sometimes the best they’ve got it “I’d be pregnant if I could.” While they want to help as much as they can, what are they to do with a box of Premama? Mom-to-be feels the weight of the world on her belly, her partner feels and acts like back-up, and they’re both looking for ways to better practically support each other through the pregnancy process. What’s the problem then? Well, it’s sitting on the shelf. The wall of pink “mama this & mama that” boxes tell her that the pregnancy process is her responsibility alone and tell her partner that they aren’t welcome. By focusing on her journey not their journey, these brands all miss out on something vital. Support, stress, and even sperm quality have a huge impact on mom & baby’s health, even serving as a predictor for positive partner-child interactions post-partum. Isn’t a no-brainer we start designing for what’s best for everyone involved? Invite practical partner support into every stage of the pregnancy process. Create a pregnancy brand built for two (and then three)! We tested three separate names and preliminary mood boards to get a feel for what moms-to-be were gravitating towards. 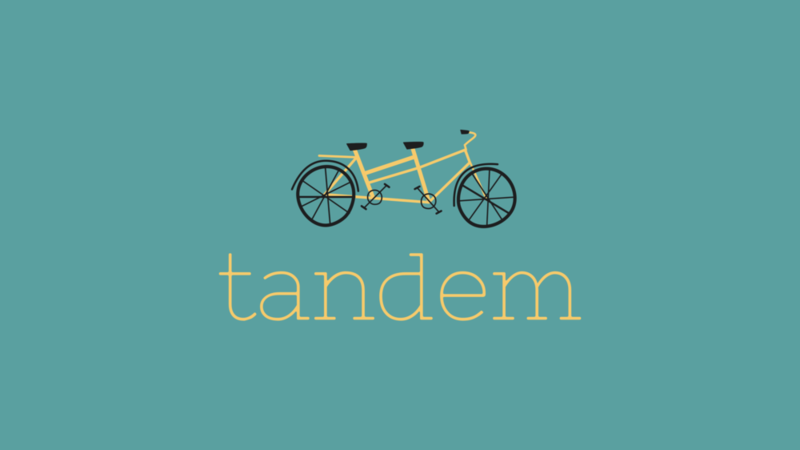 Tandem was a clear winner with visual elements pulled in from Pear. We then built an identity and strategic brand definition around that. 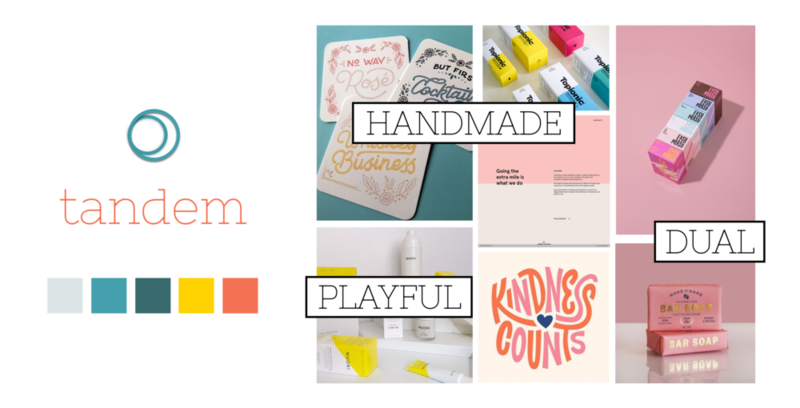 While we had 1,001 ideas as to where this brand could go, we tested & then created a recommended list of core products that spanned the pregnancy process. We then brought those to life through a sample of trying to conceive products that spanned functional & emotional support. It was news to us that men could check their sperm count window the same way women can check their fertile window, by peeing on an OTC test. We took that product out of the depths of Amazon and brought it to the shelf. Knowing that male’s sperm quality impacts things like birth weight & preterm birth, we designed pre-prenatal vitamins meant for the female physiology and the male physiology. We created a pregnancy test designed for discretion that her partner would be comfortable carrying in his basket. The pop top canister let’s her throw her test away without giving it away (or keeping it!). 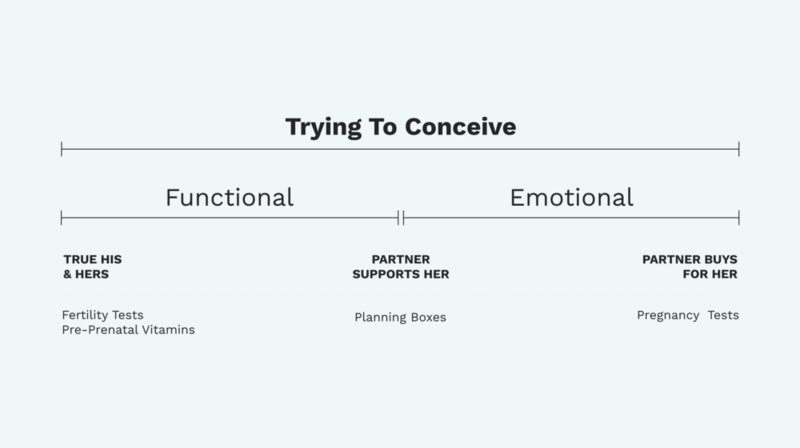 Imagine Birchbox meets marital planning for pregnancy. To solve for the “I don’t know what I need” and “we’re not on the same page” comments, we created a kit for each stage of pregnancy complete with the necessary starter products and materials that facilitate necessary communication. In TTC, you’ll see a workbook with questions like “how long are we going to try until we seek medical help” & a sticker ovulation calendar. Knowing that only 4% of moms-to-be cited a DTC brands as their favorite, we recommended launching in retail. 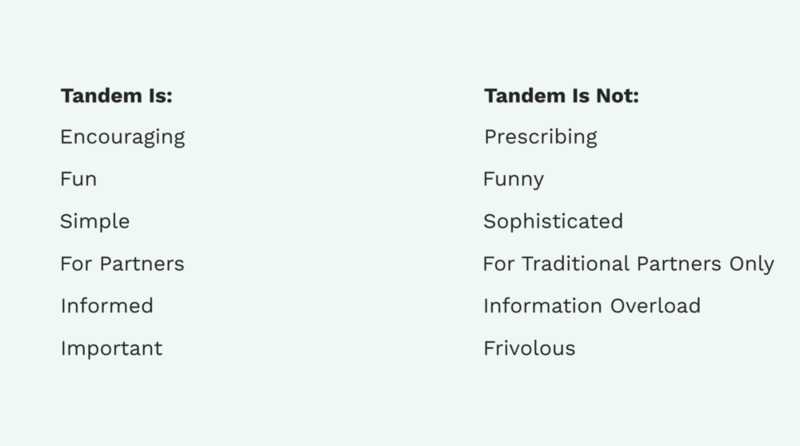 To own the fact that Tandem spans the pregnancy process, we created a vertically consolidated fixture.